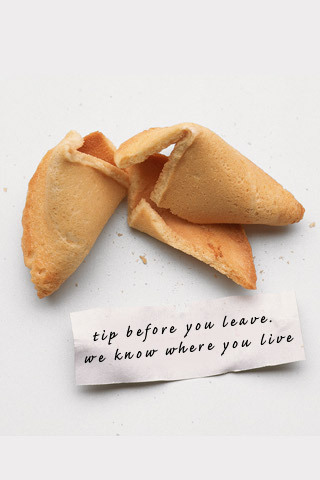 Crazy Fortune Cookie iPhone wallpaper 5. A few years back a few friends and myself were running a couple of different challenges, one of them was editing images to put inappropriate wording on signs or placard images. It took the images in different directions to the original. The fortune cookies with crazy fortunes was one of these challenges, and I am going to be loading up a couple of mine that are still favourites. Well, favourite enough that I have turned them into iPhone wallpapers to use for myself. After a few friends requested them I have made them available for everyone. If anyone has any requests for particular wording for the fortune, let me know, and when I get a chance I can add them in to the set.